A column about past, present and future ongoings in international electroacoustic and related institutions [index]. It all started in 1965, when Heinz Hönig, assistant lecturer for Jazz Praxis at the Academy for Music and Dramatic Arts in Graz under the direction of Erich Marckhl, applied for a travel authorization to the Studio Elektronischer Musik at the WDR in Cologne, with the annotation: “study trip for the realization of the planned development of an Institute for Electronic Music at the Academy.” Most likely, this trip was equally determining for the future direction of the IEM in general and its dissociation from existing institutions in Austria, all of which were mainly dedicated to recording engineering in a Tonmeister sense. Consequently, Heinz Hönig, being already well known as an expert for electronic, was entrusted with the development of the institute. 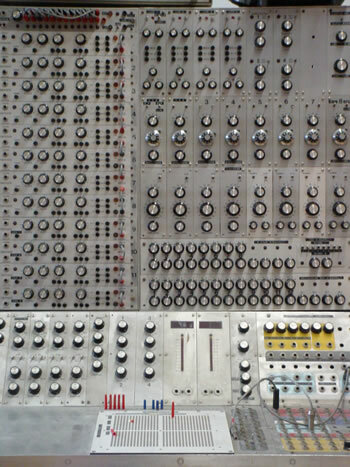 In February 1966, the Institute of Electronic Music (aka “die Elektronik”) was launched and become effective, retroactively as of 1st October 1965. From the beginning, the key task of scientific research was accompanied by the plan to establish a “course of Electronic Music.” However, it took several years, until the first electronic music compositions could be realized — mainly due to funding issues. Basic courses were held and students were offered the possibility to realize their own works within the courses “Einführung in die Elektronische Musik” (“An introduction to Electronic Music”) and “Praktika Elektronischer Musik” (“Internships in Electronic Music”). In the beginning, the main research focus was on the development of studios, in order to be able to create works using tape cutter technologies using tape recordings and oscillators. These technologies were extended in order to implement rotating sounds and transformations using ring modulators. Most of the equipment needed had to be developed and assembled in-house. In the first phase, from the beginnings until 1972, the institute concentrated on “music for tape,” which was followed (until about 1977) by a focus on “voltage-controlled synthesizers.” The highlight of this period was the Hönig 78 synthesizer. At the time of writing, this apparatus is still partially functional and is currently on display at the Technisches Museum in Vienna. Hönig 78 voltage-controlled synthesizer. Photo © IEM. Gösta Neuwirth worked and taught at the institute starting in 1968. He left both the academy and Graz after a strong dispute concerning “Neue Musik” in 1978, but his ideas and approach to the composition of electronic music continued to play an important role. During the next phase, starting in 1978, it became evident that despite the existence of hardware sequencers, computers were becoming indispensable. Since mainframe computers were unaffordable, micro-controllers (KIM, later SYM) could be adapted using 12-bit digital-analogue converters. In 1984, the institute’s move into the “Wilder Mann” at the Jakomini square in Graz heralded the beginning of the era of MIDI-controlled digital synthesizers. Andrzej Dobrowolski, who was then professor for composition in Graz, and his students influenced the artistic development until Dobrowolski’s death in 1990, developing an independent æsthetic of electronic music based on a strict, polyphonic “Tonsatz” that was often generated algorithmically. During this phase, a first computer music studio was established and was based on sound editors and sequencer programs running on Atari computers. Due to the growing interest of students and guest composers, this production studio was soon to be accompanied by a teaching studio. A few years later this setup was expanded to include a small concert room for electronic music. When Robert Höldrich and Winfried Ritsch joined the IEM, the institute entered a new phase, gradually becoming an institute for digital signal processing using computer music workstations (NeXT with IRCAM workstation). The focus shifted to real-time applications in computer music at festivals and concerts. New works of computer music were mainly developed with guest composers. Besides this, the institute worked closely with the Graz University of Technology (TUG). This collaboration was mainly driven by the development of the interdisciplinary and inter-university study area of “Toningenieur” (sound engineering), which concentrated on the technical and scientific aspects of sound engineering and acoustics — a unique feature in Europe. This development opened the new fields of sound research, multi-channel reproduction and musical acoustics — leading to “and Acoustics” being appended to the name of the institute. Owing to the huge success of the Toningenieur studies at the Graz University of Music — which has evolved from a branch of the electro-technology study into a separate branch of study — the supervision of this area became the main educational focus of the IEM. After the retirement of professor Hönig in 1995, the institute was transitionally headed by Gerd Kühr and finally by Robert Höldrich. A period of expansion followed, based on research in computer music and acoustics as well as on cooperations, leading to another physical relocation in 2000 into the current accommodation at the TUG campus. Among the studios, the new rooms house the IEM-CUBE, an acoustic research laboratory which was one of the first deployments of 3D audio reproduction systems based on higher-order ambisonics. In parallel to being a successful concert space for electroacoustic pieces, this space has become an experimental studio for sound engineers and composers alike. When Gerhard Eckel was appointed to the newly created professorship of Computer Music and Media Art, the CUBE was completed with a 3D tracking system, allowing work on æsthetic research of movement and sound. Since Robert Höldrich became vice-rector of the university in 2007, Gerhard Eckel has been presiding over the institute. Since the beginning of the millennium, the IEM has had a focus on 3D spatialization of sounds, with a special research interest in higher-order ambisonics. Complex spatialization systems require highly multi-channel audio interfaces, which have only gradually been made available since the institute started research in these systems. In 1999 this led to the first Linux driver for the RME Hammerfall 9632 developed by Winfried Ritsch at the IEM for installations and concerts requiring 24 audio channels and more. This was dubbed in 2004, when Ritsch developed the first Linux driver for the RME HDSPM card, one of the first 64-channel audio cards available using the MADI standard. In the early 1990s, real time computer music was only possible using expensive dedicated hardware like IRCAM’s Signal Processing Workstation (ISPW). This rapidly changed, when in 1996 Miller Puckette started a re-write of the Max language called “Pure Data” (Pd). The original version of Pd ran on SGI/IRIX. However it was Open Source. Günter Geiger (by now well-known as one of the creators of the reacTable, among other things), a free software enthusiast working at the IEM at the time, did an original port of Pd to run on Linux as early as 1997. Since then, Pd has become the main platform for real-time processing at the institute. With students being involved in the development of and production with Pd from the beginning, a lively local Pd community connected to IEM has formed in Graz, which eventually led to the 1st international pd~convention being held there in 2004. Since Open Source development lives on communities, a mailing list was created as the primary means of communication early, which still is one of the main communication channels within the worldwide Pd community, and currently consists of about 1500 subscribers, helping new users and having an open discussion on the future of the project. Additionally the “official” web portal puredata.info for the community is hosted at and maintained by the IEM. Development for Pure Data is still one of the biggest contributions of the IEM to this community: here, the focus is on external libraries. The most noteworthy is probably GEM, the Graphics Environment for Multimedia, an extension that allows users to do 3D graphics and image processing in real time within the audio-centric framework. Originally written by Mark Danks (and ported to Linux by Günter Geiger), GEM has now been maintained at the IEM for almost ten years. Other libraries developed at the IEM include the “iemlib” by Thomas Musil with a focus on filter design, and “zexy,” the Swiss army knife for Pd. In 2007, the institute participated as a mentoring organization at the Google Summer of Code, where the students Thomas Holzman and Tommaso Bianco were funded to push the development of Pd-specific libraries for complex data manipulation and image acquisition. Source code development is nothing without applications. Probably the most prominent of these is the CUBEmixer, a periphonic mixing application using higher-order ambisonics, entirely written in Pd. Since 2002, this constantly evolving piece of software has been utilized in most pieces produced at the institute, allowing the composers and performers to place sound objects in space and control them in real time. As a paradigm, the “art-driven development” of software and hardware tools led to several dedicated developments based on Open Source Software within an artistic research context. With the implementation of art work, Open Source development has proven to be reliable and stable enough for large music productions, and even more noteworthy, it allows users to overcome existing limits for “new music” and ideas. One of the first was the composer and sound artist Klaus Hollinetz, for whom a special Granular Synthesizer for 3D Spaces called “Grainy” was developed for real-time usage. For composer Bernhard Lang, a special loop generator was developed for live audio processing, and later also for video processing, using Pd with Gem to produce a whole series of pieces including operas, orchestra pieces and dance theatre. Among the composers who have been using the ambisonics system are David Monacchi and Olga Neuwirth. Neuwirth used it in her renowned opera adaptation of David Lynch’s film Lost Highway. In this case, Linux workstations went on tour to be able to feed different ambisonics systems in various concert halls. Peter Ablinger’s research in mapping the time domain of a piece into the frequency domain, resulted in software tools like Verdichtungen as well as several compositions performed at renowned festivals, and tape pieces. In his later series, Quadraturen, he focused on the transformation of recordings into real instruments, resulting in several pieces for instrumentalists and orchestras, as well as the opera Stadtoper (City Opera), where recordings of the city were used to produce orchestral notation, controlling a robot piano player and electronics. Stadtoper by Peter Ablinger. Photo © Peter Ablinger. Other areas like “sound-morphing” have been explored by Olga Neuwirth, who used it to morph opera singers into wolves, or Johannes Kalitzke, morphing piano into several other instruments. There have also been several ongoing scientific research projects carried out at IEM in the field of acoustics and signal processing. Successful contributions have been achieved, for example, with experiments on the perception of ambisonics, the prediction and measurement of structural vibration in car bodies, the forming of acoustical beams, and the active manipulation of the room reverberation. Recently, researchers at IEM have been exploring the interactive influence between body motion and real-time generated sound, on a perceptual and cognitive level. From the interaction of dancers with a sound synthesis controlled by the motion of their bodies, scientists find out more about the bodily perception, its speed of interaction, and influence on emotion. Another active research issue studies the sound radiation of musical instruments and its contribution to realistic playback. Specifically, computational methods are investigated that allow to use spherical arrangements of microphones and loudspeakers to accurately record (holography) and reproduce (holophony) the entire sound radiation of musical instruments, respectively. More information on current research and projects at IEM can be consulted on their website. Additional information provided by Franz Zotter. Winfried Ritsch is a professor at the IEM, composer and media artist. IOhannes m zmölnig is media artist and Open Source activist. Both are living in Graz, Austria, and working at the Institute of Electronic Music and Acoustics.